Baseball popularized the use of the Wins Above Replacement (WAR) statistic; representing a player’s estimated contribution to a team’s win tally above what a generic replacement would contribute. In this sense, it’s a roster management tool to support a keep/replace decision. However, WAR stats are often used by others for general performance comparisons. But soccer (or football if you like) does not have widespread use of a WAR-like statistic. In soccer, performance indices are typically confidential and proprietary, making it difficult to verify their validity. Teams and analysts, understandably so, do not want to give away their competitive advantage. And those that are shared publicly, do not usually describe values in terms of team performance, or comparisons to replacements. And this is our goal here; to offer a performance measure for each player, compared to readily available “replacement players” in similar positions. Because soccer awards three points for wins and one for draws, I’ll use Points Above Replacement (PAR) instead of wins. In other words, we’ll estimate how much a player has contributed to his team’s overall standings – when compared to an easily-acquired, hypothetical bench player. The elements of this statistic require a (1) performance measure based on game actions, (2) a reference group, and (3) a method for relating individual performance to team results. For first part, I use the performance measure described in previous articles (see, Player Value Recap (2018), where more details can be found). As reported earlier, the performance measure adds possession context to match events. And match events are then scored based on whether the actions increase or decrease the chances of scoring – based on how much similar actions, in the same areas of the pitch, affected historical possession results. Further, the performance measure has the benefit of reporting values in goal equivalents (GE). The second step is to define a reference group for the performance measure. Appropriating from baseball definitions for replacement players, I too decided the replacement players should represent a player that could easily be found at a minimum salary. In the US, and for MLS players, their salary information is publicly available (or at least a consistent proxy for what their salary may be). As a result, I define a “replacement player level” to be the average performance for players with a base salary of $67,000 or less. In MLS, a $67,000 salary is the minimum salary for the supplemental roster. To be fair, Byzantine MLS roster rules mean a 67k player could be on the senior roster, or supplemental roster, or reserve roster. And some players making more could be placed on the supplemental roster via homegrown player or Generation Adidas exceptions, and perhaps many more reasons. Unsurprisingly, I did not want to get caught up interpreting MLS roster rules. Thus, MLS players (in the 2017 & 2018 seasons) with base salaries of $67,000 or lower are used to set the replacement player performance level. One additional element is required for reference groups; the on-field position. Different roles lend themselves to different performance levels. And the most meaningful comparisons are like for like. As a result, I went through each match of the 2017 and 2018 seasons and identified the starting positions for players based on team formation. Substitutes are labeled “subs” – no attempt was made to assign a role to a substitute player (too labor intensive and subjective for subs). The result led to twelve positional labels to cover forwards (LF, F, RF), midfielders (CAM, CM, LM, RM, DM), defenders (LB, RB, CB) and goalkeepers (GK). I used “CAM” for players lined up centrally between other midfielders and forwards; for example, the 1 in a 4-3-1-2. I used “DM” for central players lined up in the half space between defenders and other midfielders; such as the 2 in a 4-2-3-1. Players were assigned to the position that they started in the most. If there was a tie, I used the position that best represented the roles the player assumed. For example, a hypothetical player with five starts at CM, five starts at LM, and three starts LB would be placed in the LM group – because he tied for starts between LM and CM, but most often plays on the left. If the role was still in doubt – or if their only experience was as a sub – then I placed in them in the central role of the first position group listed in the MLSPU salary spreadsheet (i.e., forwards are “F”, midfielders “CM” and defenders “CB”). This is not an exact science, but allows one to adjust if one has issues with my labels. For practical purposes, I condensed the twelve positional labels into 6 replacement player reference groups. Attacking players consist of LF, RF, F, and CAM players. Wide midfielders are LM and RM players. The central midfielder category is made up of CM and DM midfielders. Fullbacks are the LB, and RB players. And the CB and GK categories consist of their namesakes respectively. There were 372 players on MLS rosters in 2017 and 2018 with base salaries below $67,000 (a player on both lists is counted twice). However, only 231 of these players registered minutes during their season and contributed to the replacement player level assessment. In creating the replacement groups, we need to be mindful of potential selection bias. The 231 players that got on the field may not represent the 372 players making 67k or less. One can reasonably suggest the players with minutes are better than those that didn’t get minutes. In addition, the position groups are relatively small; and a handful of players with starting-level minutes dominate the values. For each group, between 13% and 26% of the players contribute over half the minutes. For an illustration, 46 attacking players with over 21,000 minutes in 2017 or 2018 make up the replacement value. The weighted average of these players is 0.111 GE per 90 minutes, which is lower than the 0.164 GE league average for these positions. However, six players contributed over half of the minutes; Dominique Badji (’17), Daniel Salloi (’18), Corey Baird (’18), Cory Burke (’18), Latif Blessing (’17), and Daniel Salloi (’17) had over 11,000 minutes. And this group – with regular playing time – equaled the position average of 0.164 GE per 90 among them. Without these players, the replacements have a weighted average of 0.050 GE per 90 – a dramatic difference from the mean replacement value. As a result, the replacement value can be reasonably criticized as artificially inflated. However, the replacement players pool does have variety; including some really good players that just need playing time to show it. Thus, I kept the replacement value as the weighted average for the entire group. All the players are compared to consistent standards which serves our purposes here; but further replication and larger samples are needed. With the reference group defined, as best we can, we can easily contrast a player’s performance to the replacement player level. However, we still need to translate the goal equivalents to team performance. Fortunately, GE (or goal equivalents) is set up for a clean calculation to team performance. Team results are highly correlated to goal differential. At the match level, goal differential literally defines who wins. And at the season level, the relationship between the final point standings and season goal differential remains strong. 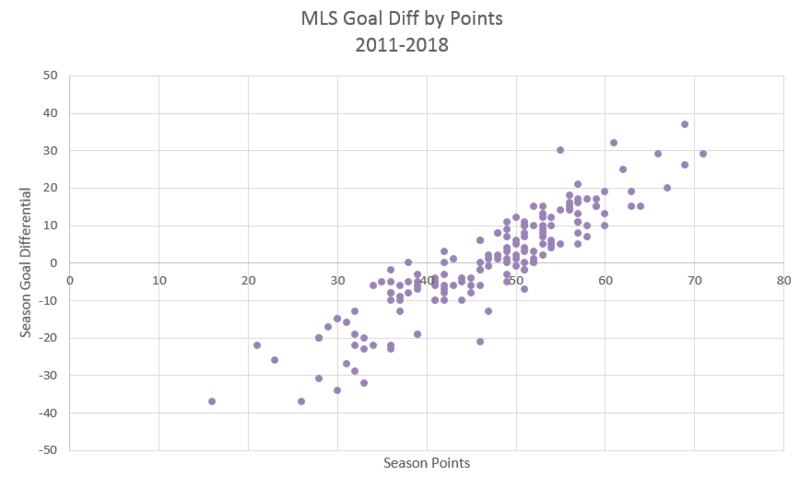 Looking back at the last eight seasons, where MLS teams played 34 games, season points and goal differential is correlated at 0.906. Of course, there are outliers, but the relationship is evident even from a quick glance at the plot. Estimated Season Points = 0.662 * (Goal Differential) + 46.6. Player value is reported in the sum contributed over the course of the season. For my PAR calculation, the replacement player is assumed to have played the same number of minutes. One could justify unequal minutes to evaluate injuries, or expected playing time, etc. But I did not do that here. Each player with minutes in 2018 was assigned a representative position using the same process describe above. I then compared the 2018 performance values to the relevant replacement groups. For some context, a team of replacement players (in a 442 or a 4231) would be expected to earn about 32 points. This is close to the average of the bottom three teams each year (30 points). For European leagues without easily accessible player salary information, I have used the average of the bottom three teams as the replacement player level. Basically, the idea is that these teams are relegated and a fire sale of their players often occurs. At the other end, a team of players in the top 10% of each position would be expected to earn about 78 points (NYRB set the season points record this year with 71 points). With salary caps, it is not surprising to see teams fall short of this level. Among the individual players, we see that PAR is distinct from the player value metric. Josef Martinez led all players in MLS with the highest value per 90 minutes player. In other words, he had the highest performance rate for his time on the pitch. However, Josef is third in PAR as it’s dominated by goalkeepers at the top. Some of the player value v. PAR difference is due to playing time. Stefan Frei contributed slightly more value over the season than Josef (14.73 goal equivalents and 14.33 respectively). But Frei also had an extra 120 minutes to earn the extra rating. Thus, the season long contribution from Frei gets the edge. With respect to GK dominance, the largest factor is the replacement player level. A replacement attacker is still pretty good, with about 0.111 GE per 90. In contrast, the replacement GKs averaged -0.109 GE per 90. And PAR incorporates the level of the hypothetical replacement. As a result, we had patterns like Almiron who contributed the equivalent of 13.31 goals himself, a stellar season result. But he only added a little over six points to the table above what a replacement body would offer (i.e., 6.39 PAR). Player value and PAR offer two unique performance perspectives, with their use determined on the question to be answered. The following table reports the 2018 players, their position group, season contribution (player value in GE over the season), and 2018 PAR.